This was an emergency project for the North Carolina Department of Transportation after Hurricane Irene, which created a large breach in Highway 12 on the outer banks of North Carolina and cut off mainland road access for thousand of people. This project was managed with HeavyJob. 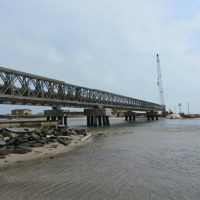 Carolina Bridge Company was asked by the NCDOT to construct the Pea Island Emrgency Bridge, a 662-foot bridge to allow the highway to Pea Island to reopen after the damage from Hurricane Irene. They began mobilizing over Labor Day weekend, and in less than seven days had begun construction with six cranes, 50 very hard-working people, and a lot of lights. The company worked 24/7 for 40 days, completing the 662-foot bridge, two large sheet pile structures, and the road work needed to reopen Highway 12 and reconnect the 70 miles of road cut off by Hurricane Irene.